Whiplash is essentially a type of neck sprain which occurs as a result of an auto accident or any type of accident where an abrupt movement occurs with the head. When a whiplash occurs, the head is quickly forced forward or backwards, and then snapped back in the opposite direction. It is an extremely common injury resulting from rear-end collisions and can cause permanent damage under certain circumstances. Are you suffering from the pain that is associated with a whiplash injury that was caused in an auto accident? If you or a family member has been injured due to the negligence of another individual, the victim may be entitled to receive compensation for his or her losses and damages including; pain and suffering, property damage, loss of wages, medical expenses, and funeral expenses. Learn more, complete the "Free Case Evaluation" form to the right - It's 100% free. Nearly any type of auto accident has the ability to cause damages to the soft tissues of the neck. This is due to the great force created by an automobile causing an instant and uncontrollable reaction in the body. Following an auto accident, there may be many recognizable symptoms a person may experience, which could mean whiplash has occurred. 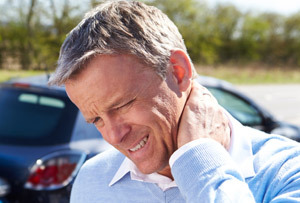 In most instances, symptoms of whiplash are evident within a 24 hour period following an accident, while it is not uncommon for symptoms to disappear and return within a few days. The Spine Research Institute of San Diego has stated that about 10 percent of those injured from whiplash injuries become permanently disabled. Therefore, it is important to receive medical treatment immediately following a car accident. If you are experiencing any of these symptoms following an accident, you are advised to seek immediate medical attention. This will ensure you receive the correct treatment for your injuries while also providing attorneys with medical documentations of your injuries. These documents can be used to prove that your injuries were caused by the negligent actions of another driver. Determining the types of damages available following a whiplash injury will depend on the severity of the accident along with proving that all losses and damages were caused by the negligent actions of another individual. To learn more about the damages which may be available, we welcome you to contact our law firm. A whiplash injury can occur in the blink of an eye and cause devastating life-long consequences to victims and their families. Our team of personal injury attorneys at Harbin & Burnett is prepared to fight for the victims whose lives have been forever altered due to the negligence of another individual or entity. With our office in Anderson, South Carolina, our attorneys are able to serve throughout the entire state and elsewhere as needed. Call us today at 1-888-821-0247 or 1-800-634-5328 or simply complete the Free Case Review form located at the top of this page.